Home/What’s Happening/Latest News/Guilty or not guilty? 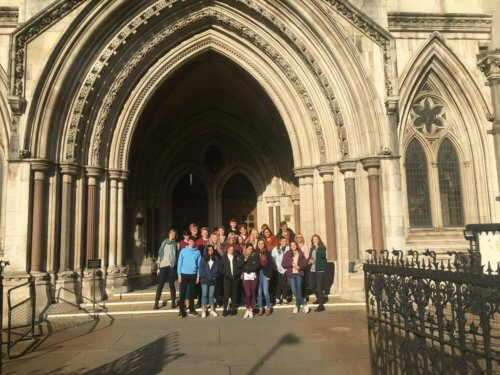 Last week, the Upper Sixth psychologists set out on the annual pilgrimage to the Freud Museum and the Royal Courts of Justice. At the Freud Museum, students were given a talk led by a Freudian psychoanalyst, who provided much food for thought, before viewing the museum’s ‘Freud, Dalí and the Metamorphosis of Narcissus’ exhibition, which explores the connection between Sigmund Freud and Salvador Dalí. After a quick dash to the Royal Courts of Justice on the Strand, the students prepared and enacted a trial, based on a real-life scenario. With prior knowledge of the case they were able to debate real historical sentencing options and compare these to sentencing options in the present day whilst making links to topics in the A Level curriculum and viewing key spaces in the Law Courts.